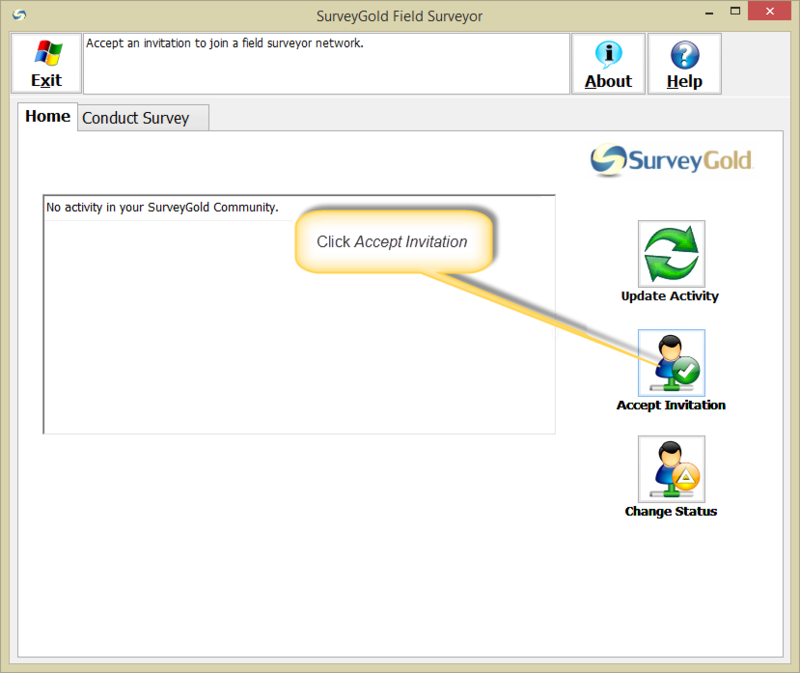 The Community tab folder in the SurveyGold application is the place for you to create a roaming network of surveyors all of whom use collect survey results on your behalf using any surveys you have created. You create your field surveyors network by inviting a colleague via an email created in the Community tab. When they accept they are able to download and install the free SurveyGold Mobile application on to their computer. You can then assign surveys to them easily and collect responses from them in real-time. Field surveyors can use the free SurveyGold Mobile application to collect responses whether or not their computer is online. When they are ready to submit their responses back to you, they can do so when their computer goes online. Responses they have collected are submitted securely to you via the Internet. All field surveyor capabilities are enabled for a SurveyGold application user with a Premium or Ultimate subscription. The field surveyors are not required to have a subscription and can use their SurveyGold Mobile application for free. The Community tab in the SurveyGold application provides the ability to create a network of field surveyor colleagues and turn any of your surveys into a field survey. Any survey you have created in the Setup Survey tab can be made available to your field surveyors network as a field survey. Step 2 - When Your Field Surveys appears, select Add. 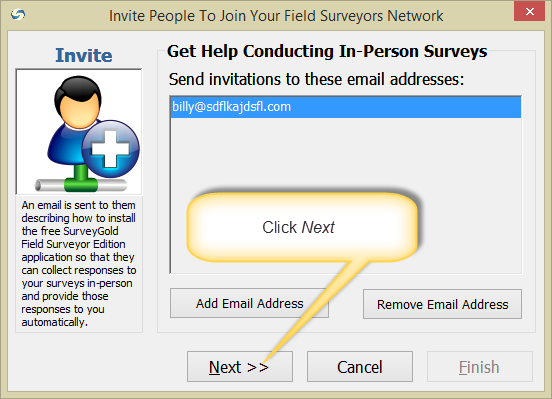 Step 3 - When the Add a Field Survey window appears, select a survey from the list and select Next. SurveyGold makes your survey as a field survey. This makes it possible to assign the field survey to any or all members of your field surveyors network so that they can conduct the field survey for you. After making a field survey, you can proceed with managing the field survey usage. 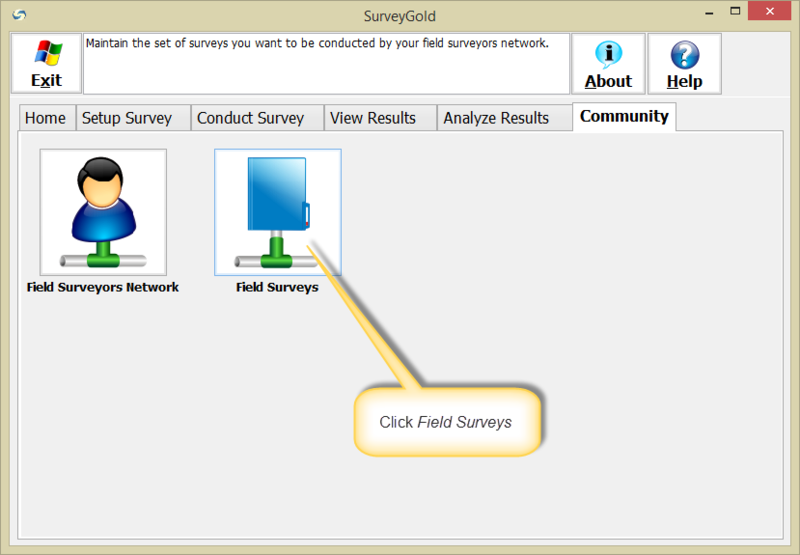 Step 1 - From the Community tab in the SurveyGold application, select Field Surveys. Step 2 - When Your Field Surveys appears, select a field survey and select Manage. Note: Any action taken results in a notification in the Home news feed in the field surveyor's SurveyGold Mobile application. When a survey no longer needs to be accessible to your field surveyors network, it can be removed. 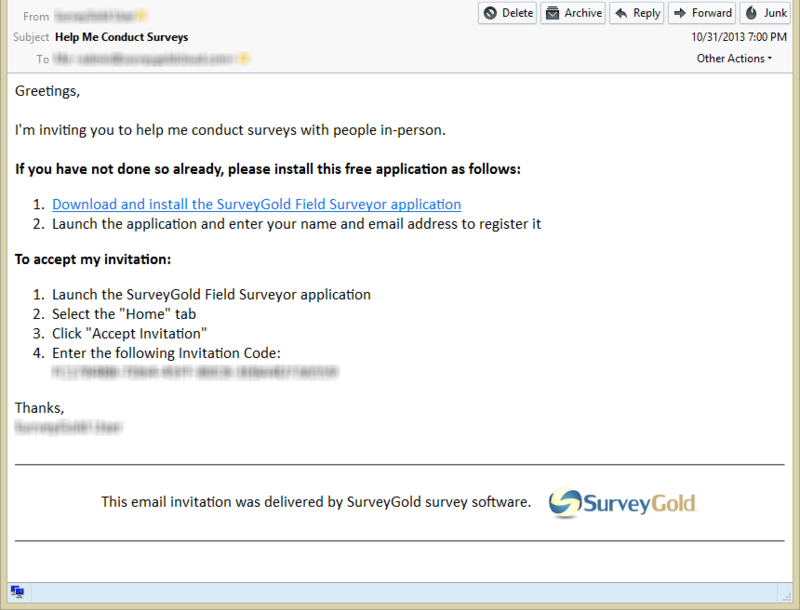 Note: Removing a field survey does not remove the survey from your SurveyGold application. Rather, it removed is from distribution to your field surveyors network. When this occurs, the next time the field surveyor selects Update Activity in the Home tab of their SurveyGold Mobile application, any responses they have collected for the field survey will be submitted prior to their field survey being removed from their application. Step 2 - When Your Field Surveys appears, select a field survey and select Remove. Follow the step-by-step instructions that follow to remove your field survey. Step 1 - From the Community tab, select Field Surveyors Network. 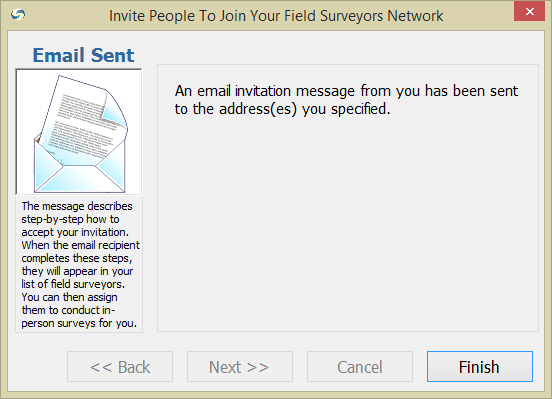 Step 2 - When Your Field Surveyors Network appears, select Invite. 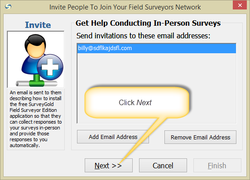 Step 3 - When the Invite People to Join Your Field Surveyors Network window appears, select Add Email Address and enter the email address of the person you want to invite. Note: Select Add Email successively for each person you want to invite. Step 4 - Select Next to send invitation emails to the people you specified. Note: The invitation email is created and sent automatically. The text of the invitation cannot be altered by the survey author. 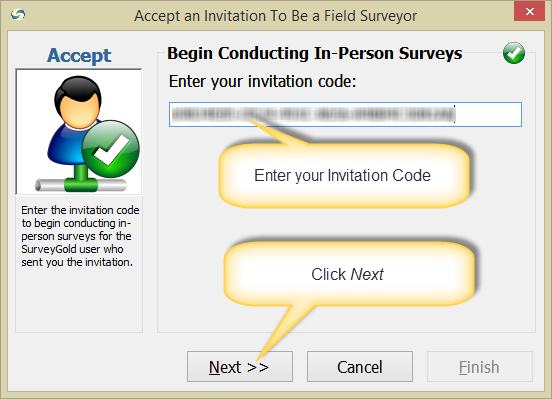 When a field surveyor accepts your invitation, you are notified via email with instructions for how to approve the acceptance. 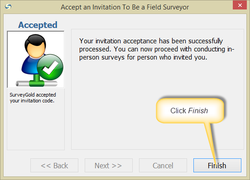 After you approve the acceptance, you can assign a field survey to the new field surveyor. 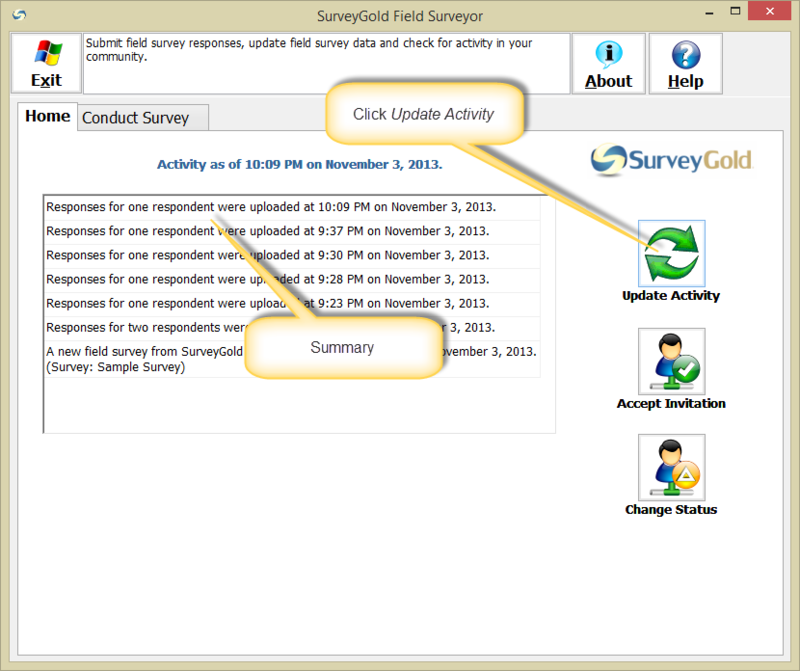 Survey responses submitted by your field surveyors network flow into your SurveyGold application when you perform the Update Activity action in the Home tab. After a field surveyor accepts your invitation to join your field surveyors network, you can proceed with managing their field surveying activities. 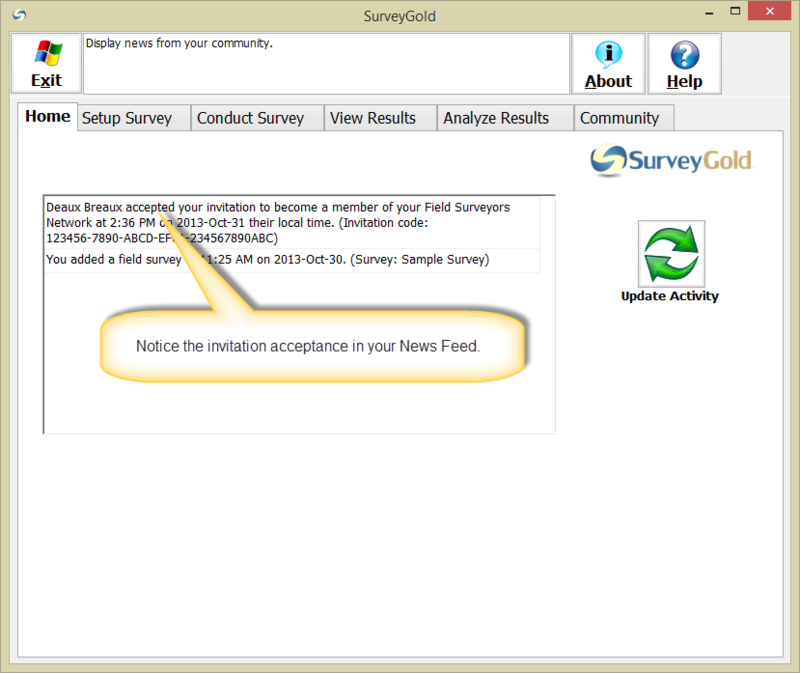 Step 1 - From the Home tab in the SurveyGold application, notice the notification in your News Feed indicating that someone accepted your invitation to join your field surveyors network. You can now proceed to the Community tab to manage this field surveyor. 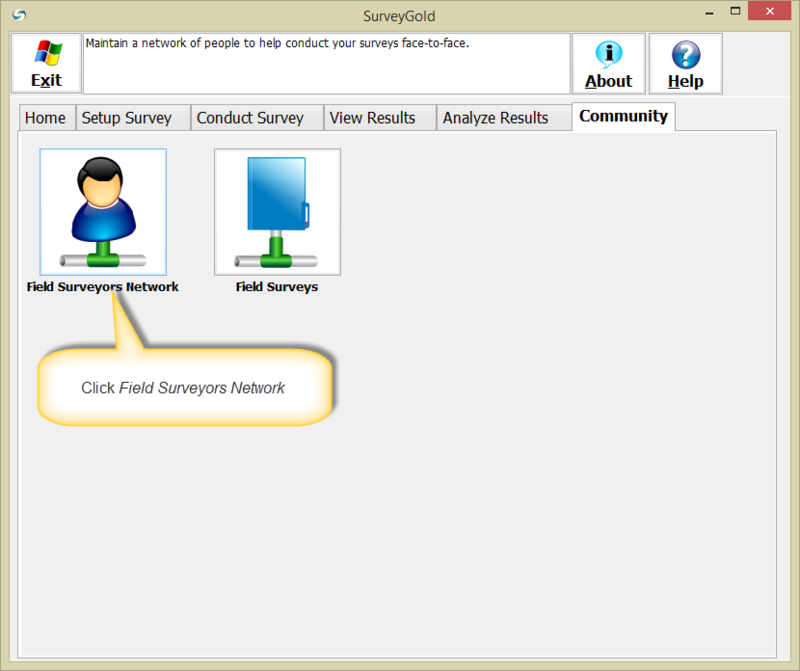 Step 2 - From the Community tab in the SurveyGold application, select Field Surveyors Network. 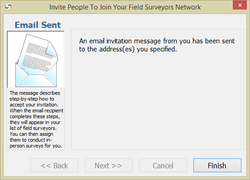 Step 3 - When Your Field Surveyors Network appears, select a field surveyor and select Manage. When a field surveyor is no longer available to be included in your field surveyors network, they can be removed. Note: Removing a field surveyor does not remove any responses collected by them from your SurveyGold application. Rather, they are removed from your field surveyors network. When this occurs, the next time the field surveyor selects Update Activity in the Home tab of their SurveyGold Mobile application, any responses they have collected will be submitted prior to their being removed from the field surveyors network. 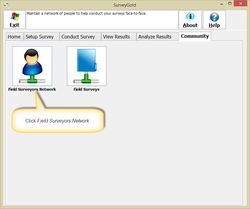 Step 1 - From the Community tab in the SurveyGold application, select Field Surveyors Network. Step 2 - When Your Field Surveyors appears, select a field surveyor and select Remove. Follow the step-by-step instructions that follow to remove your field surveyor. SurveyGold Mobile is a free application used by a field surveyor to participate in collecting responses to field surveys on behalf of a survey author. 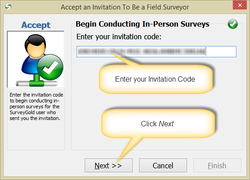 The application is free and is downloadable via instructions received in the invitation email received from a survey author using their SurveyGold application. 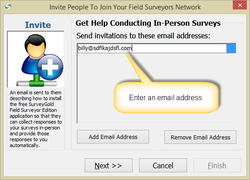 An invitation to participate in a survey author's field surveyors network is received via email. Refer to the email and perform the following actions to accept the invitation. Step 1 - From the Home tab in the SurveyGold Mobile application, select Accept Invitation. Step 2 - When the Accept an Invitation To Be a Field Surveyor window appears, enter the Invitation Code and select Next. Note: Copy and paste the Invitation Code directly from the email to ensure accuracy. Step 3 - Wait a moment while your invitation is accepted. Then select Finish. 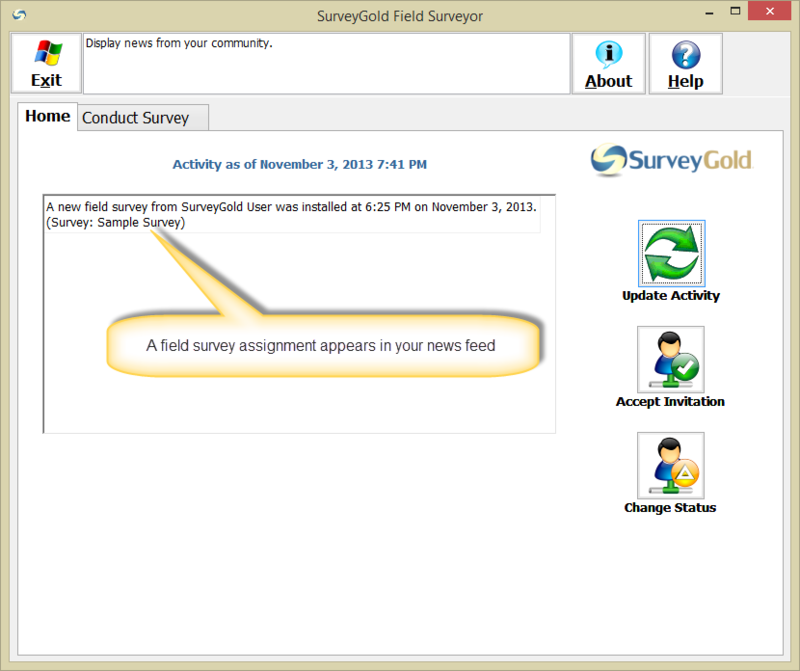 Step 4 - Later, when you are assigned a field survey by the author, the SurveyGold Mobile application displays a message in your Home tab news feed and a field survey appears in the Conduct Survey tab. Note: There is typically a delay between the time you accept an invitation to be a field surveyor and the time your first survey is available in your SurveyGold Mobile application. 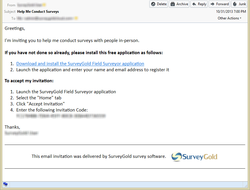 This is because the survey author receives notification in the Home tab news feed of their SurveyGold application that you accepted the invitation. After the survey author sees this notification, they can assign you to any of their field surveys via their SurveyGold application, at which point they appear in your SurveyGold Mobile application. A field surveyor collects responses via the Conduct Survey tab in the SurveyGold Mobile application. For guidance on collecting survey responses see Section 5: Conducting Your Paper or In-Person Survey in the topic entitled Automatically Collecting Web Responses. A field surveyor submits collected responses while online via the Home tab in the SurveyGold Mobile application. Note: When you select the Conduct Survey tab after performing this action you find that all respondents listed for your surveys are gone. This is normal because they have been submitted to the survey author.